We had an unspoken tradition in the nine-unit apartment building where I grew up in Bombay (now Mumbai). No matter who you were or where you came from, every celebration — be it a wedding, birthday or festival — you would always cook enough food to share with your neighbors. All differences and neighborhood grievances would be put aside. We had four Muslim families in our building, and during Eid, which marks the end of Ramadan, I would keep the door to our home cracked open to let the perfume from the large pots of food cooking make their way in. By the time I was a teenager, I instinctively and very excitedly knew to expect an aromatic biryani in which potatoes and large chunks of mutton had been cooked in layers of long-grain basmati rice; a pineapple raita usually made with tomatoes and cucumbers; and sevaiyan, a vermicelli-type dessert prepared with sweetened milk. Yogurt — dahi (the Hindi word) or curds, as it is more commonly referred to in India — occupies an important role in the Muslim, Hindu and Parsi communities. References to yogurt can be found in ancient Indian Ayurvedic texts dating to 6000 B.C. The Persians prepared cucumber in creamy yogurt, most likely a precursor to the Indian raita, while the cooks in the Mughal emperor’s kitchens used yogurt in marinades to create succulent pieces of flavorful meats. The lactic acid and dairy proteins help to tenderize the meat and to add tanginess, making it much more flavorful. When we’d visit my dad’s family in the northern state of Uttar Pradesh, breakfast would often be a chilled glass of cold buffalo’s milk drunk to combat the sweet taste of deep-fried jalebis, which are similar to funnel cakes but soaked in simple syrup. Lunch and dinner always included a side of plain yogurt or raita to keep the body cool. Back in my parents’ home in Bombay, we would either buy yogurt from the dairy near our home or make it when my parents had the time. It wasn’t difficult. You’d start by boiling fresh milk and then let it cool until just lukewarm, stirring in a teaspoon or two of a previous batch of yogurt and then covering the bowl with a lid and leaving it to sit in a warm place. Within a day, the bacteria would do their work, breaking the milk sugars down to form lactic acid, which would then coagulate the milk proteins to form a white puddinglike mass at the bottom of the bowl. A watery, pale greenish liquid, the whey, floated on top. When I moved to America for grad school, I assumed making yogurt would be easy. After all, it was just fermentation. I thought all I needed was a batch of previous yogurt, a bit of warmed milk, and the right amount of heat and time. When I tried it, the consistency and texture were always off. I eventually learned to take advantage of the warmer temperatures of my oven to ferment the yogurt and to use organic, nonhomogenized milk free from any added stabilizers or fillers. Still, I have to admit that I don’t make it as often as I would like. That’s partly because my Indian grocery store in Berkeley now carries several varieties of Indian-style yogurt that have the same taste and texture as the homemade kind I remember. Unlike in the U.S., where sweetened and flavored yogurts are popular, most Indians still prefer the traditional unflavored kind even when multinational companies like Dannon try to break into the market with their yogurt products. Habitual variations and preferences in food can be difficult to overcome. But sharing food at holidays and celebrations, just like my Bombay neighbors used to, is one way to welcome people to look at a familiar ingredient in a new way. 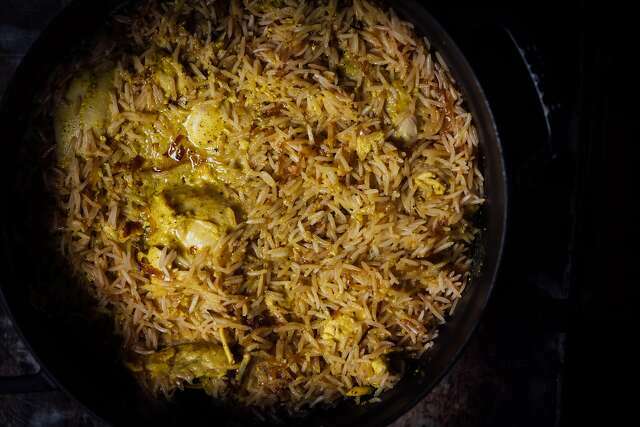 Pulao, or pilaf, is a good one-pot dish that doesn’t require too much fussing over. To speed up the cooking time, I presoak the rice and cook the chicken separately. A salad and a side of plain yogurt are all you need. To make the chicken: Blend the yogurt, garlic and spices together until smooth. Pat the chicken pieces dry and place them in a gallon-size zip-top bag with the marinade. Seal, shake to coat evenly, and refrigerate for 2 to 4 hours. Transfer the chicken and marinade to a medium saucepan and bring to a boil, then reduce heat to low, cover and cook until the liquid has reduced by about half and the chicken is tender, 15 to 20 minutes. Remove from the heat. To make the pulao: Check the rice for any stones and then rinse in a fine-mesh sieve until the water is no longer cloudy. Transfer to a medium bowl, cover with water and let it sit for 30 minutes. Heat 1 tablespoon of the oil in a Dutch oven, or heavy-bottomed pot with a lid, on medium-high heat. Once the oil is hot, add the onion and salt, saute for 5 minutes, cover with a lid, reduce heat to low and cook until the onions are evenly browned, 10 minutes,stirring occasionally. Add the second tablespoon of oil, then the cloves, cardamom and bay leaves and cook for 30 to 45 seconds. Drain the rice and fry it with the onions and spices for 4 to 5 minutes, until the grains are coated with the spices and oil. Remove half of the rice from the Dutch oven. Add the chicken pieces in a layer over the rice. Add the remaining rice on top, pour the liquid from the chicken along with ½ cup water, and cover the pot with two layers of aluminum foil to form a seal, capping it with the lid. Cook on low heat for 30 minutes. Remove from heat and allow to sit, covered, for 10 minutes. Carefully peel back the foil, garnish with the cilantro and serrano pepper, and serve hot or warm.